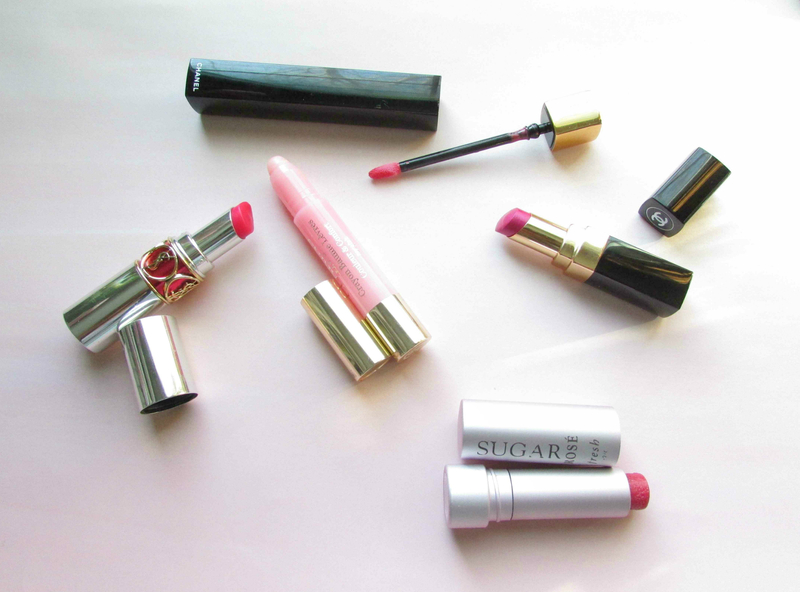 when spring comes around, my feminine side comes out and all I want to wear on my lips is various shades of pink, from the barely there to the bright & saturated. unless I want something long-lasting for a specific event, I favor lighter formulations for the day-to-day, like balms, glosses, and sheer lipsticks. 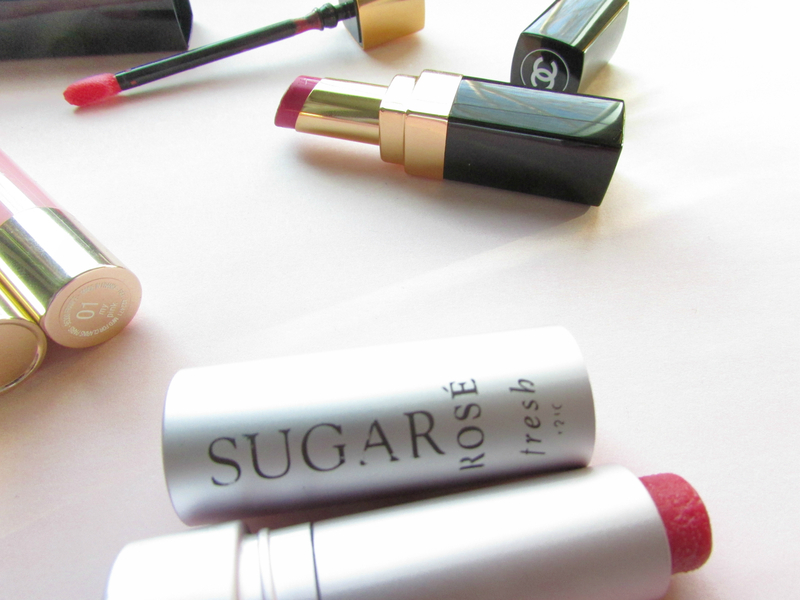 for the my-lips-but-better look, lately I’ve been reaching for the clarins crayon balm in my pink (limited edition), a pH-dependent shade, and the fresh sugar lip treatment in rosé. I’m on my third tube of this stuff. I love the smell (it smells like lemons, which instantly makes me think of lemonade) and that it’s ultra moisturizing. 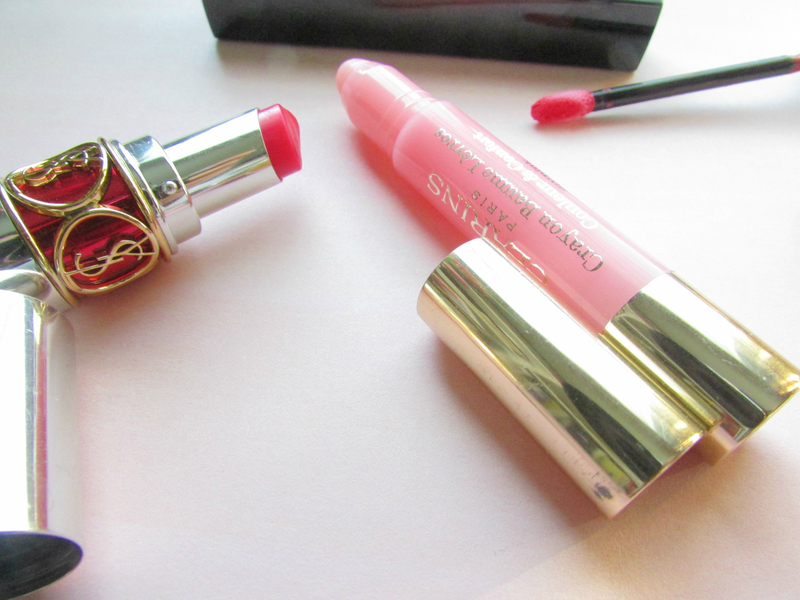 if I want a smidge more color, I reach for the ysl volupté sheer candy in no. 4 succulent pomegranate. it looks super intense in the tube but on the lips, it’s a very bright but sheer candy pink. if I want lipstick pigmentation without actually going for a lipstick, my go-to is the chanel rouge allure gloss in extase, a lovely medium pink that’s not too bright. I really like the formulation of these glosses – they’re pigmented & reasonably long-lasting for a gloss, and they sit nicely on the lips without feeling heavy. also, not going to lie, the packaging is so chic. 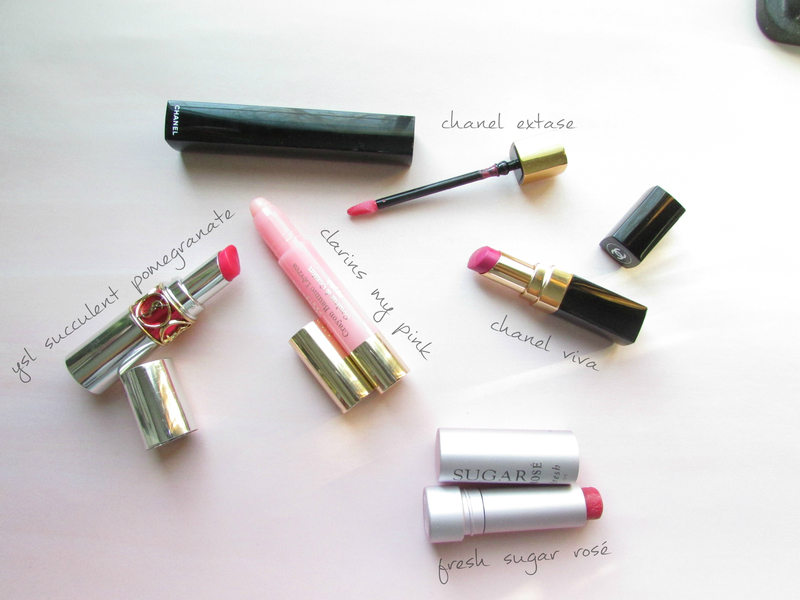 and lastly, when nothing but full-on color will do, my pink of choice is chanel viva. this was a limited edition color from last year and was part of their rouge coco shine line, making it sheer on first application but can be built up layer by layer for added color. this is a lovely fuchsia that is statement making without being garish.